Welcome to our Game In Progress review of Arkane Studios’ Prey, a new sci-fi horror game from the developer that produced Dishonored. This second entry covers everything from Morgan Yu’s arrival in Deep Storage to your first attempt to upload the Coral research. Players can choose for their Morgan to be either male or female. Matt is playing as a guy and, for simplicity’s sake, will be referring to the character as such. When last we talked about Prey, I was struggling to get through it. Even with a growing arsenal, I just couldn’t make a dent in the Typhon, those inky alien bastards that had overwhelmed the space station Talos 1. But as I slunk through the Crew Quarters and looked over my options for taking down a Telepath, one of the game’s bulkier enemies, I did something I told myself I wouldn’t; I gave in to the temptation of transhumanism. In that moment of great need, I crossed a line, imbuing myself with psychic powers stolen from the very force I’d been fighting against and leaving Morgan’s humanity behind, all in an attempt to find some kind of foothold against my foes. Saying it worked out for the better would be an understatement. I’ve been tearing through Typhon ever since and injecting myself with more and more psionic abilities as this miserable mission goes on, but that moment of inner conflict, where it forced me to stop and consider whether I really wanted to let go of my humanity, was the first sign of what has eventually emerged as the game’s strongest, most thoroughly explored question: How inhuman are you willing to become? 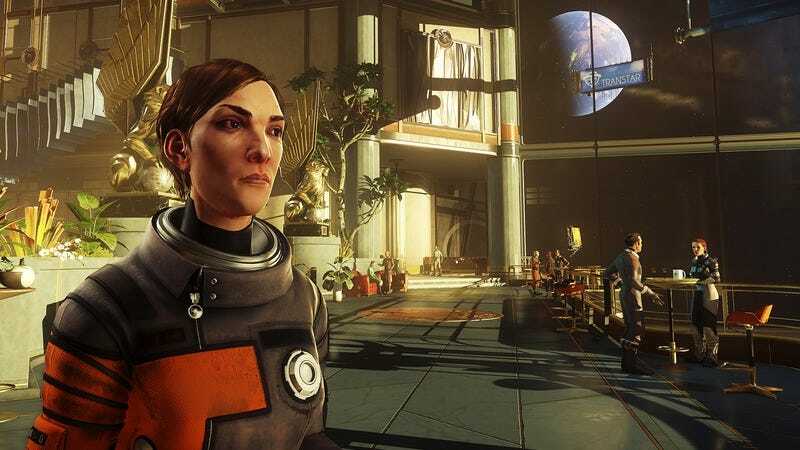 In the pantheon of sci-fi musings, it’s not exactly a fresh angle, but Prey deserves credit for exploring it in ways that tie directly into how you play the game. At its most simplistic, there’s the literal measure and quantification of Morgan Yu’s humanity. The game is very careful to warn you that taking on alien powers will make Talos 1’s defenses turn against you, as they can detect the alien matter that’s building up inside you and will no longer recognize you as human. But it takes more than one psionic ability to put you over the human-Typhon threshold. The game wants you to get a taste of the aliens’ powers. It dangles them in front of you as a reprieve from the relative struggle to survive and lets you dabble in them without consequence, to a point. Beating the game without these abilities is far from impossible—better players than I are already singing the praises of the “no-psionics run”—but in my experience, they make the game a hell of a lot more manageable and fun. In the grand scheme of things, the obvious consequences for deviating too far into alienhood aren’t all that disastrous. Turrets, the only automated threat to your inhumanity, become increasingly rare as the game goes on and are easily dispatched or hacked to support you. But Prey jabs at your decision in more subtle ways. Morgan’s ambiguously aligned big brother, Alex, explains that one of the conclusions researchers have been able to draw about the Typhon is their distinct inability to feel empathy, one of the reasons they’re so quick to murder you at first sight. As the game goes on (and you’re theoretically becoming more and more Typhon filled), you’ll be thrust into situations where your own empathy is put to the test. Is it really worth going out of your way to save the survivors on the station even if it means putting yourself in danger and derailing your mission? And in at least one specific case, acquiescing to the crew’s demands would bring turrets into the picture, putting their survival directly at odds with your own, if you’ve been Typhoning yourself. Given the game’s ruthlessness and the preciousness of your resources, the immediate rewards these rescue missions promise don’t exactly seem worthwhile. They’re more altruistic than your typical video game quest, forcing you to weigh the lives of the people around you against your own convenience without much material gain to even up the options. But as your AI companion January points out, there’s an additional wrinkle to all of this: If you’re going along with its plan, then your ultimate goal is to blow up Talos 1 and everything (and everyone) on board. Isn’t saving these people’s lives and giving them the false hope that they might make it back to Earth more cruel than just letting them die? The game even gives you a heartless human foil in the form of a psychopathic murderer you first meet while he’s masquerading as the ship’s chef. There’s no difference between him and the Typhon. He’s a caged animal doing anything he can to survive and escape, with no regard for anyone but himself. If anything, he might be worse than the aliens, as he appears to take pleasure in inflicting pain and suffering on others. Depending on how long you let him linger, he can be one of the game’s most lasting presences, butting into your earpiece with his ominous ramblings and acting as a reminder of the monster Morgan has the potential to become. The specific beats of the murderer’s story aren’t exactly riveting—the “twist” surrounding his true identity is so obvious that it seems like the game wants you to figure it out before the actual reveal—but like a lot of things in Prey, it’s the character’s moral relation to Morgan and the player’s choices that make him interesting. It’s also representative of where Prey’s storytelling priorities seem to lie. The overall narrative is relatively sparse, mainly told through video messages and a handful of vague flashbacks, but those characters you meet and decide the fate of serve as an important focal point. It’s tempting to go off on one of those tired tangents declaring the setting of Talos 1 as the best-defined character in the game, but while it’s an impressive creation from a clinical design perspective, it’s not exactly spectacular. It’s a space-bound manifestation of corporate banality, a floating office building with all the boring sectors and departments you’d expect from such a thing. Instead, the survivors you meet are the closest thing Prey has to action set pieces or exciting flourishes. That’s partially because there are so few of them, but it’s also a reflection of how well-drawn they become when you take the time to dig through their backstories, especially if you find it in your heart to keep them alive. Purchase Prey here, which helps support The A.V. Club.